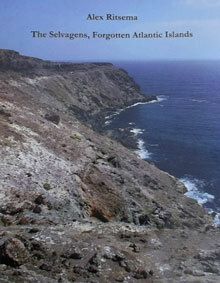 The Selvagens are probably the ultimate destination for anyone interested in Western Palearctic seabirds. 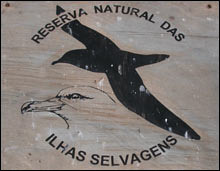 If you look for the Salvage Islands or Ilhas Selvagens (in Portuguese)  the "wild islands"  in an atlas for the first time, it will take time for sure. They are no romantic islands in the Caribbean with golden beaches and bars, but a tiny rocky archipelago, about 162 nautical miles (300 km) south of Madeira and 80 nautical miles (148 km) north of the Canary Islands. The archipelago consists of two groups and has a total area of 283 hectares (2.83 km²). Very few birders have had the opportunity to go there and a round-trip by boat from Madeira to these islands is indeed a memory for life! 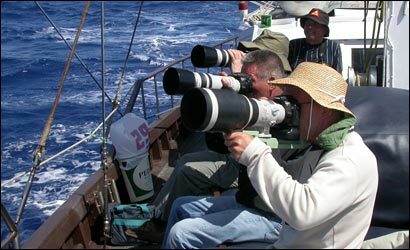 Seabird photographers aboard "Ventura do Mar" during the tour to the Salvage Islands on 6-10th July 2005. Photo: Niklas Holmström.